Pete Conrad was a famous NASA astronaut who is best known as the third person after Neil Armstrong and Buzz Aldrin to walk on the moon’s surface. Conrad walked on the moon during the Apollo 12 flight. This space trip lasted from November 14, 1969 to November 24, 1969. Pete was born in Philadelphia, Pennsylvania on June 2, 1930. He completed his graduation in Aeronautical engineering in 1953 from Princeton University. After graduation, he joined the U.S. Navy and became a pilot. Pete Conrad got selected by NASA as an astronaut in September 1962. He was co-pilot on the Gemini 5 spaceflight and command pilot of Gemini 11. On November 14, 1969, Conrad went on the Apollo 12 flight to the Moon along with Richard Gordon and Alan Bean. Pete Conrad flew total four times in space during his career. During these four space missions, he logged 49 days, 3 hours and 37 minutes in space, a record at the time. He was awarded Congressional Space Medal of Honor in October 1978. In December 1973, he retired from the U.S. Navy and accepted a position as Vice President for operations of American Television and Communications Corporation. In 1978, he took another executive position with the McDonnell-Douglas Corporation in Long Beach, California. In May 1973, he set a record of 28 days in space as commander of Skylab 2, the first manned space station. He died in a motorcycle crash in Ojai, California on July 8, 1999, at the age of 69 years. Declan, Tobin. " 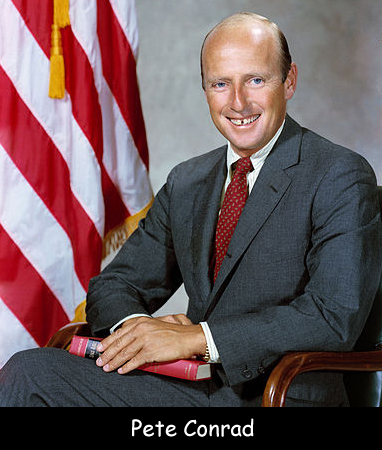 Pete Conrad Facts for Kids ." Easy Science for Kids, Apr 2019. Web. 26 Apr 2019. < https://easyscienceforkids.com/pete-conrad/ >.